Sticky rice is next to “normal” rice the most eaten staple food in South East Asia. Why? Because it is high in carbohydrates. Who needs muesli or expencive bars when you can have a sticky rice based energy bomb? You can use the bombs for all outdoor activities and sports or just for breakfast. It will bring back your energy. 100 % gluten free and vegan! You can use other dried fruits the way you like it! Be creative! Steam the sticky rice. Soak all berries in enough water for at least 15 minutes. Prestle cashew nuts in a mortar. Mix all ingredients except coconut flakes and roll to a small ball with your wet hands. 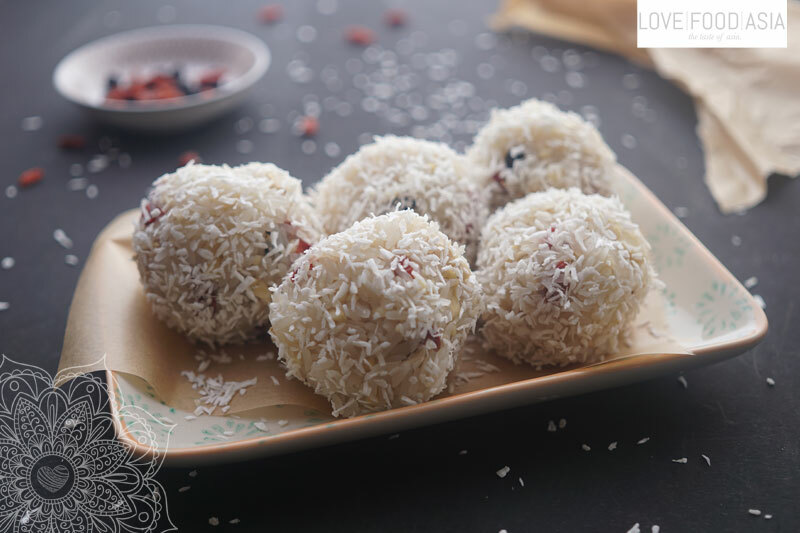 Roll sticky rice ball in coconut flakes. Roll energy balls in cling film to keep it fresh or eat them directly.